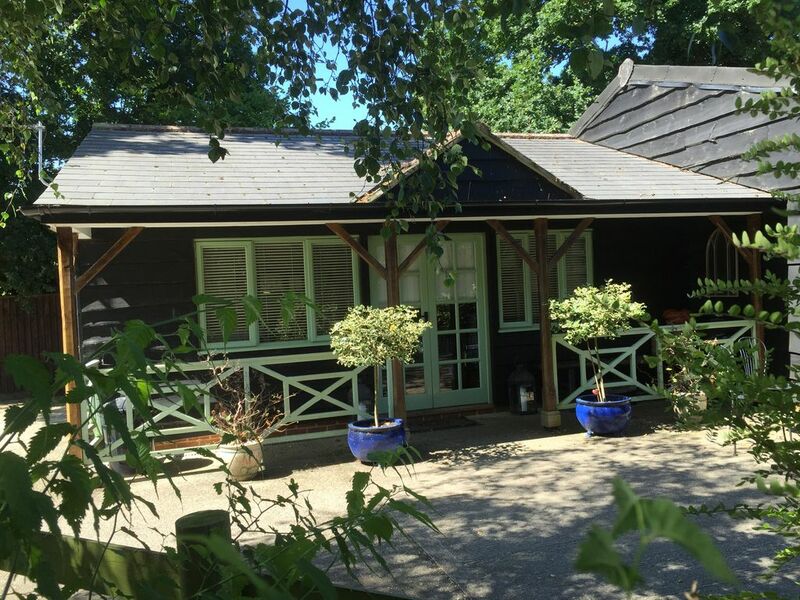 Well appointed spacious studio accommodation in a rural location to sleep 4 with gated entrance and ample off road parking situated in a small village in the New Forest and close to the coast. Open Plan living/sleeping space with TV and DVD Player. Sofa Bed/Day Bed opens into a double bed. Travel Cot available. 3-Seater and 2-Seater Sofas. Table and 4 x Chairs. Kitchenette comprising Oven, Hob, Microwave, Fridge with Freezer Shelf, Dining Table and Four Chairs, Toaster, Kettle, Cafetière, Crockery and Cooking Utensils. Notes on accommodation: Travel Cot available. Outside: Patio table and 4 x chairs, use of garden and barbecue. Utility Room: Ironing Board and Iron can be provided upon request. Cleaning / Towels / Linen / Maid service: Towels (bath, hand and tea towels) and bed linen will be provided on a weekly basis. Laundry undertaken upon request. Cot bedding should be brought by guests. Really lovely place to stay, very peaceful and quiet. The garden and paddock was perfect for our dog, all enclosed and the owners ensured the main gate was shut throughout our stay for extra peace of mind. The owners dog, Rosco, is lovely and friendly, our dog loved playing with him! A very dog friendly place to stay, which was one of the main things we were looking for. The property is only a short drive to beach and forest walks. I don’t think our dog wanted to leave and neither did we! Would highly recommend, great place to stay and unwind with beautiful walks nearby. Beautiful stay, loved it, Rosco doggy is so lovely too! This place was perfect, easy to access so many places by car & is in a beautiful village. Lovely barn that is very modern cosy & well kept. Woke up to birds singing, it’s just beautiful! Even better to be greeted by the very special Rosco when we were heading out. Jane & Vincent are so lovely & did everything to make our stay easy, comfortable & filled us in on the best places to go. We would love to come back soon, I can’t recommned enough the barn & how lovely Jane & Vincent are. Thoroughly enjoyed our stay at this lovely dog friendly barn conversion with friendly and helpful hosts. Great family getaway. Right on the edge of New Forest. Lovely barn home. All opened planned which was great for keeping an eye on the little ones. Based at the rear of the property which was great for privacy and that home feeling. The owners were very welcoming, friendly and made you feel very much at home. The location was great for long walks through the forest which was only a 5min drive or 15min walk to some really beautiful views in the woods. Great local eateries within a 10min drive. It was about 25mins from either Bournemouth or southampton so days out were easy to get to. Its perfect if you like that 'living in the woods or farm' feeling. Thank you very much guys we will definitely recommend you and we will be returning in the future. Vincent, Jane and Rosco the dog were very welcoming and amazing hosts. The barn was furnished perfectly and it was very cosy! Can't wait to stay again. Closest Airports - Southampton 30 minute drive and Bournemouth 25 minute drive. Heathrow is about 90 minutes. We are located in a small village on the edge of the New Forest. Two local farm shops are a 5 minute drive and New Milton and Lymington is a 10 minute and 15 minute drive respectively. By Train - Brockenhurst 10 minutes, New Milton 10 minutes and Sway 5 minute drive. Beaulieu Motor Museum - World famous National Motor Museum, Palace House and gardens, historic Beaulieu Abbey and globally known Auto Jumble. Bucklers Hard - On the banks of the Beaulieu River, in the heart of the New Forest National Park, you will find the peaceful haven of Buckler’s Hard. The exciting Maritime Museum and Buckler’s Hard Story gives an insight into the history of this 18th century shipbuilding village focusing on its vessels including those built for Nelson's Navy. Lyndhurst known as the capital of the New Forest offers a wide range of shops, cosy tea rooms, old world pubs, cafes and fine restaurants. Brockenhurst lies within the Heritage Area of the New Forest. The New Forest is all around you and wild ponies, deer and cows roam at will. The Rhinefield Ornamental Drive is worth a visit, especially when the rhododendrons are in bloom in the spring. Lymington A beautiful Georgian market town which is world renown as a sailing resort; there are two large marinas and two sailing clubs. Close by the sailing clubs is an open-air seawater bath that was built in 1833. There is a number of interesting independent shops including some designer boutiques. On Saturday a market is held in the High Street. At the bottom of the High Street a cobblestone road leads down to the Old Town Quay, still used as a base by commercial fishing boats. Barton on Sea beauty spots include the cliff tops which have a golf club and magnificent coastal walks stretching from Milford-on-Sea to Hurst Castle and the Isle of Wight. The beach offers safe swimming and the famous fossil beds. Christchurch has two rivers, two castles, an 11th century Priory Church, a mill of Saxon origin, a medieval bridge and the site of a civil war siege in 1645. Poultons Park is a family theme park with various attractions and rides, beautiful landscapes and gardens. Booking Notes: A booking deposit of 25% is required and full balance payable 6 weeks before arrival or immediately if less than 6 weeks. Changeover Day: Changeover days are flexible. Arrival of guests after 4 pm, however an early arrival can be accommodated by prior arrangement. Departure time by 11.00 am please. Notes on prices: Prices quoted are based on two people sharing. For additional guests £10.00 per person per night is payable over the age of 2 years. Minimum stay is 2 nights and 3 nights over a Bank Holiday period.